Irrespective of the technology and the technicality that goes into creating an application, it is the user interface that is going to make the end user love the product or service. The user interface of an application has to be designed keeping in mind, the profile of your users, the industry standards and the philosophy of your organization. 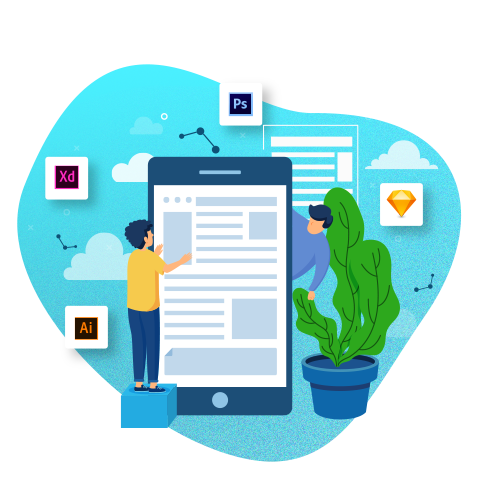 Irrespective of the application being for the web or a mobile, user interface is of vital importance in determining the functionality and intuitiveness of the app. The concept of a good user interface is contingent upon the utility and the user profile. There are user interfaces like Craigslist and rate it that might not fit into the definition of a good user interface, but it has not in any way disappointed users with respect to them finding what they wanted. It is be understood that the access of your application does not essentially happen from a single device with a single screen size. Given the fact that your web application might be access data from a desktop browser or mobile browser or the tablets in between, I\it is essential that your application interface adapts itself to the screen size. Since most of the applications needed to communicate with the web I need to share its space with other applications, it is important that the user interface does not take up a major chunk of the memory at least in relation to the utility of the application. Claritaz brings you the services that will garnish your mobile application with the right user interface and experience. We bring the concepts of being lightweight, intuitive and recreate the interface with your users in mind so that we do not exhibit our capability but more of your empathy in the application. Web applications are some of the most universally Axis applications. Web applications represent commitment-free access to your services, and while it is important not to force the user into a subscription or a commitment, it is important that there is a passive coaxing into the user subscribing To your services. we bring in the concepts of lightweight, intuitive and easily navigable elements to ensure that your application is a delight to use. While the utility my reminder same, we understand that the mobile user is a lot more impatient, has Limited access to visual pointers and it is not a mouse but just a finger that is going to select the options. Considering all of these factors, we create your mobile application interface in a minimal, lightweight and intuitive fashion so that your mobile experience is seamless. In addition to this, we also incorporate a few elements that might Make the experience with the mobile better, like location-based services and push notifications. There might be instances when you have the idea and the technology ready and it is just the user interface that puts you a step behind the phase of launching. In these instances, the UI application development services of Claritaz will help you get the much-needed assistance in developing a robust user interface that will help you launch your product. Get in touch with our team and we will collaboratively take it forward to give your application the appealed it takes to hit the market!